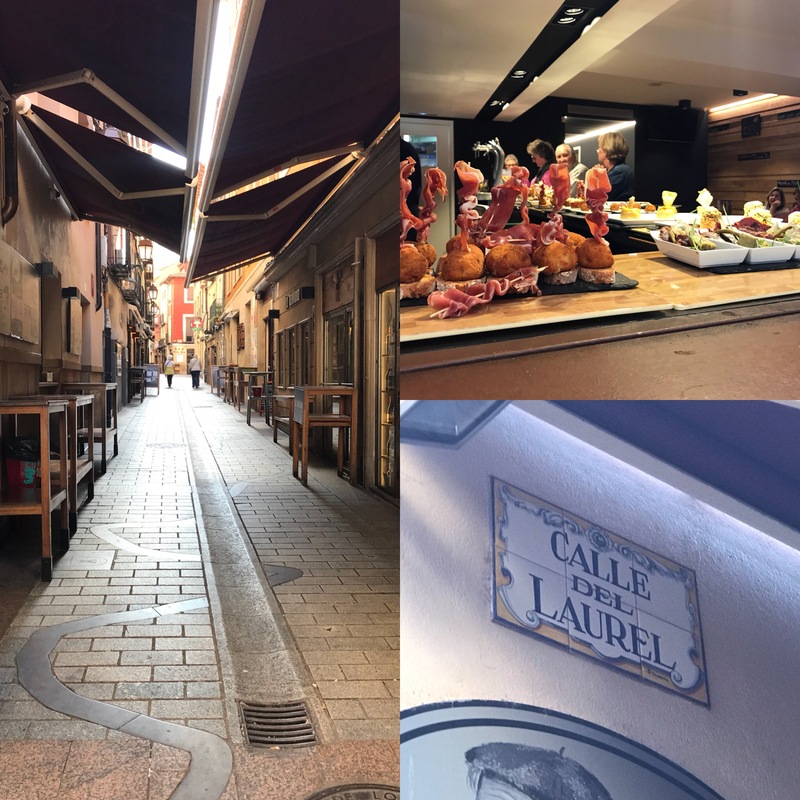 There is a little pedestrian-only street in the heart of Logroño that is famous for its popular and always-packed tapas bars. 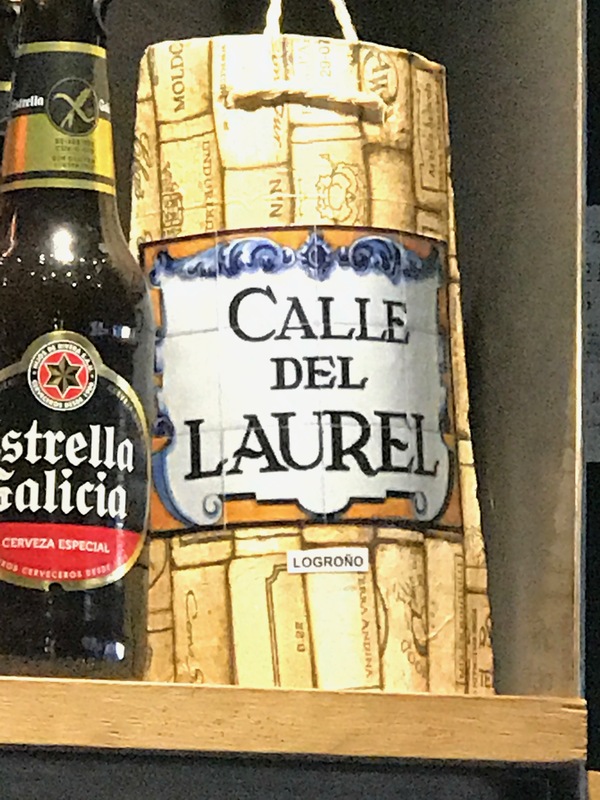 Calle de Laurel (Laurel Street) has so many places to visit, tapas to sample and wines to drink that it is nearly impossible to spend time in all of them in only a weekend, let alone a night. I managed to try 9 dishes in one night and it was a bit much for me, but it was worth it! 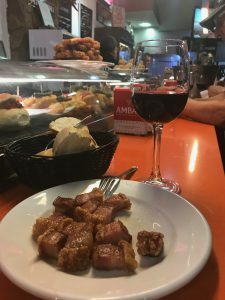 Here are the recipes and some wine pairing suggestions so you can bring the food from this Spanish street to your next party. Some of the tapas bars don’t serve cava, so I had opted for a godello - which is similar to a chardonnay (without being a chardonnay) and can handle the saltiness and fattiness of the mini panini (bocadillo). A classic cava would have been my first choice to cut through the richness of the ham and cheese. 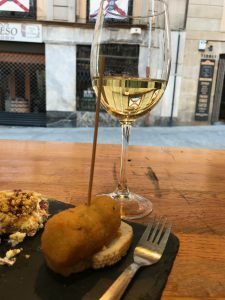 These croquettes are so full of cod that I naturally opt for a clean and crisp Albariño to match the taste of the sea. 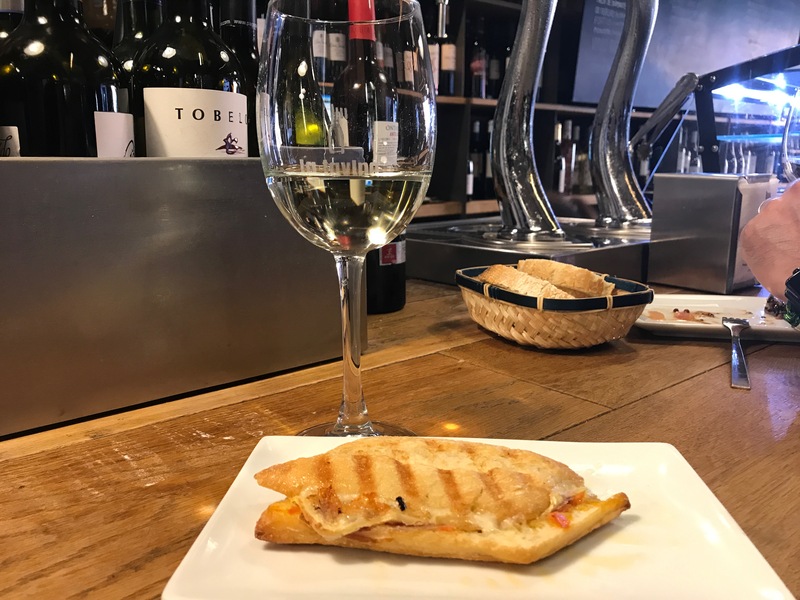 There are many stellar bottles to choose from in this style from the Rias Baixas region in the LCBO that you can experiment all summer long with just about every shellfish and seafood dish. 1. Place milk, garlic and cod in a small saucepan over medium heat and cook for 10 minutes or until cod is tender. Drain mixture, reserving the solids. 2. Flake cod and crush garlic into a bowl. Add potato, olive oil, lemon zest and juice, and cream. Season with salt and pepper. 3. Shape into 14 oblong-shaped croquettes, then refrigerate for 30 minutes or until firm. 4. Place eggs, flour and breadcrumbs in separate bowls. Dredge croquettes in flour, shake off excess, then dip in egg and coat in breadcrumbs. Fill a deep-fryer or large pan one-third full with oil and heat over medium heat to 180°C (or until a cube of bread turns golden in 10 seconds). 5. Working in 2 batches, gently drop croquettes into oil and fry, turning occasionally, for 3 minutes or until golden. Remove and drain on paper towel. 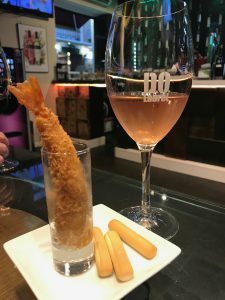 A dry and crisp rosé is a nice break from the chilled whites and the deeper fruit flavours are an even better segway into some tastings of reds. This dry rosé is versatile to go with fried shrimp, a sushi platter or even a classic burger. 1. Butterfly shrimp by cutting vertically down the back of the shrimp. Leave tails on. Season shrimp with salt, pepper, and seasoning salt. 2. Heat enough oil to deep fry the shrimp in a skillet to 350F. 3. Put panko crumbs in a shallow dish. Add seasonings to taste and mix well. Put flour in a separate shallow dish. 4. Beat the eggs and water together. 5. Dip the shrimp in the egg-water mixture. Add the shrimp to the flour. Toss to coat. 6. Dip again in egg-water mixture. Toss shrimp in panko crumbs. 7. Fry in hot oil at 350 degrees F until golden, about 3 minutes. You may have to turn the shrimp to evenly brown them. 8. Drain the fried shrimp cooling racks over paper towels. Keep shrimp warm while frying batches of shrimp. Serve with lemon wedges, cocktail sauce or tartar sauce. 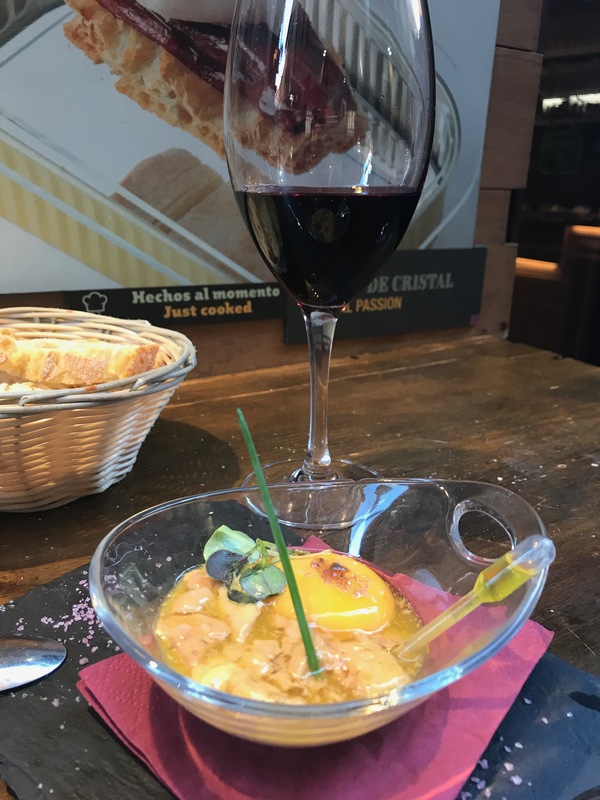 This is an award-winning tapa from the area that seems to be a Spanish version of a classic egg and foie cream dish from France. I guessed at duplicating what I saw and tasted in this dish. 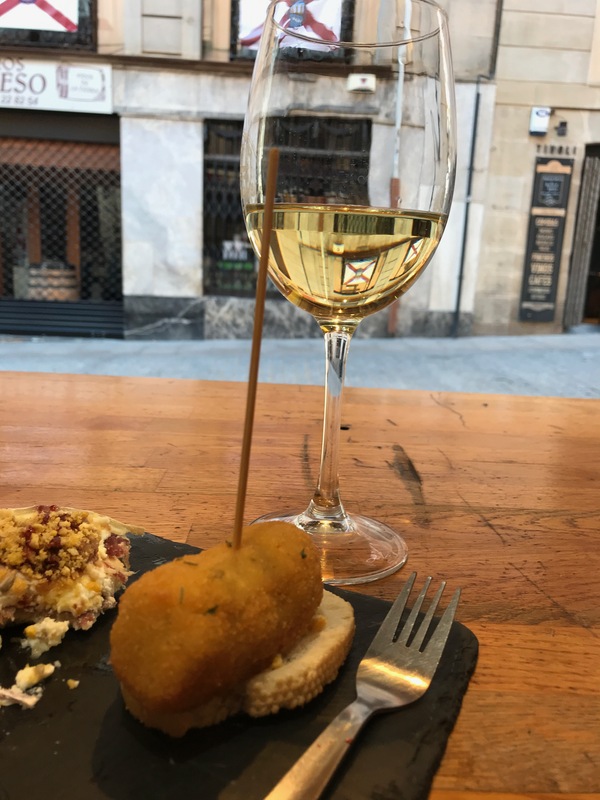 A rich, buttery chardonnay is a good foil for all this richness, but in Spain, a godello is the closest local choice. 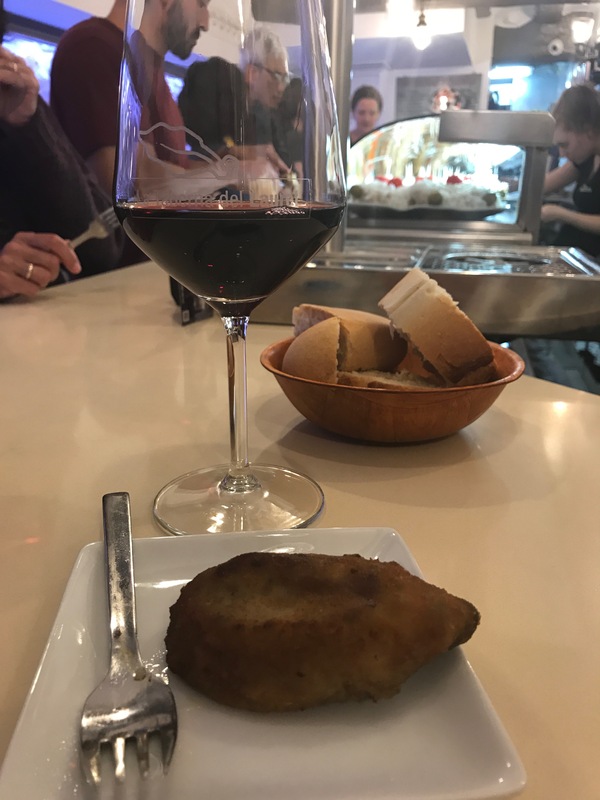 And yes - a cava works here as well. 1. Lightly butter four 4-ounce ramekins or soufflé dishes. 2. Divide pâté pieces among prepared dishes. 3. Drizzle 2 tablespoons oil into each dish. 4. Place 1 egg yolk into each dish and cover tightly with foil. 5. Fill large skillet with water to depth of 1/2 inch. Bring to simmer over medium heat. Add ramekins. 6. Heat until egg yolks are still runny, about 8 minutes. 7. Remove ramekins from water; remove foil and wipe ramekins dry. Serve immediately sprinkled with ham bits and have guests stir everything together before eating. Serve with toast points if desired. I was already enjoyed a light Tempranillo when I tasted this dish, but at home I would opt for another Albariño - but one that is a little bolder than the classic style. If you can find one, an Albariño that has spent some time in oak would be my favourite choice for this pairing. Heat a large pot with about 1" of water over high heat. Once it comes to a boil, add mussels and cover. Cook for about 5 minutes or until the mussels are opened. Remove them from the pot and allow to cool enough to handle. Separate the meat from the shells and save 1/2 of the shells. In a sauté pan over medium-high heat, sauté onion, garlic, white wine and serrano with the olive oil until cooked through and starting to brown. Add mussel meat and stir to combine. Remove from heat. In a medium sized pot over medium-high heat, add butter. Once melted and bubbling, add flour and 1/4 cup of the milk and stir to combine. Add the remaining milk using a whisk until the sauce is thick. Stir mussel serrano mixture into the white sauce until well-combined. Arrange the mussel shells - inside facing up - on a large lined baking sheet. Spoon one of the pieces of mussel meat into each shell and divide remaining sauce over each one. Sprinkle with fresh breadcrumbs and salt and pepper. Bake for 12-15 minutes until golden brown and bubbling. Serve warm. 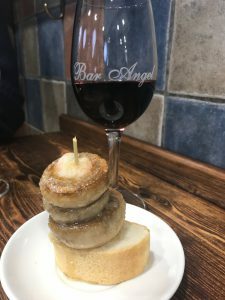 Bar Angel is most known for their lively atmosphere AND their garlic mushrooms…because that is all they serve. Sautéed in heavy amounts of garlic and garnished with a tiny shrimp, the meaty, flavourful bites call out for a dry and fruity classic Tempranillo with enough zip to balance out all that garlic. In a hot sauté pan or on a griddle pan, over high heat, add olive oil and mushrooms. Sauté for 5-6 minutes until just before mushrooms are just cooked through. Add garlic and season with salt. Sauté for another 2-3 minutes and serve warm over baguette slices. Drizzle olive oil over the platter and serve immediately. 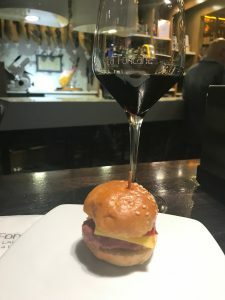 In Spain, the ham used is from a ham sirloin, so this is a great idea for using up that ham from Easter or other holiday. A medium-bodied fruity blend can handle the ham and cheese and then take on whatever comes next. 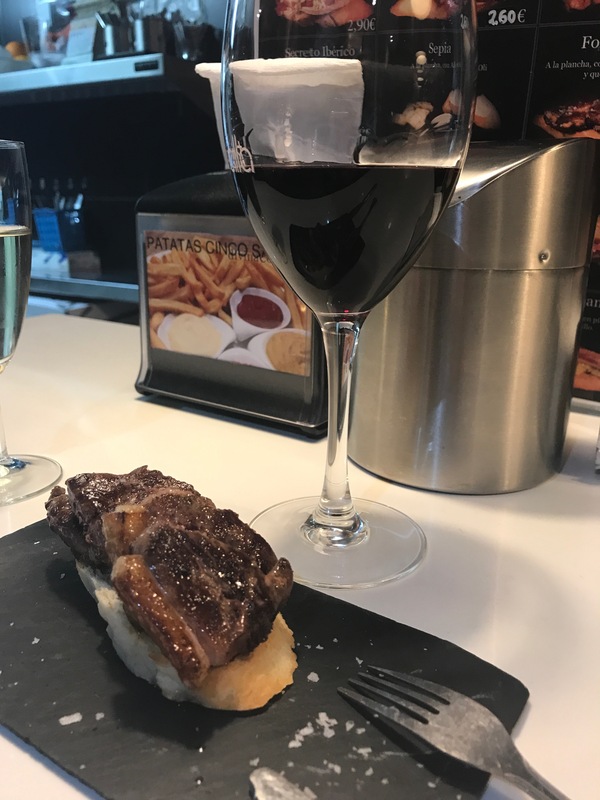 This Reserva blend is made of Garnacha, Tempranillo and Cariñena. If you don’t have any of the Reserva blend left, my pick would be to jump into a full Garnacha. A touch of oak to smooth out the edges but all the fruit flavours to tackle the sweetness of the jam and the richness of the duck. Brush the bread slices with olive oil. Toast on a hot griddle pan and set aside. In a sauté pan over medium-low heat, place the duck breasts skin side down and allow to cook for 10-12 minutes. Pour off the fat from the pan, turn the breasts over and bake in preheated oven for 10 minutes. Remove from the oven and allow to rest for 3-5 minutes. Slice each breast into diagonal slices. Top each crostini with some caramelized onion jam and divide the duck breast slices over each. Serve immediately. This dish is not for the faint of heart. Fatty, rich and meaty, these little bites of deep-fried juiciness call for a top-notch Rioja blend. One of my favourites available in Ontario is the Gran Reserva from the infamous Barón de Ley winery. This is their specialty and it shows. Let the bacon dry at room temperature for 24 hours. Pour the sunflower oil into a large frying pan, enough to cover the bottom (about 2mm/3/4" deep) and place over medium low heat. Meanwhile, cut the bacon into strips with a thickness of 1". Place the strips in the frying pan with the skin side down. Fry for 30-40 minutes in batches on medium high heat. You will need enough oil to cover half of the torrezno. Add more if necessary. You will notice that bubbles begin to appear on the skin. The final cooking time will depend on the skillet and heat used. Once you see the skin covered with bubbles and a textured and golden crust, remove the torreznos from the saucepan with a slotted spoon. Remove from the oil and allow to rest until ready to serve. Before serving, fry again until crisped slightly, drain on kitchen paper towel and let it cool slightly before eating.